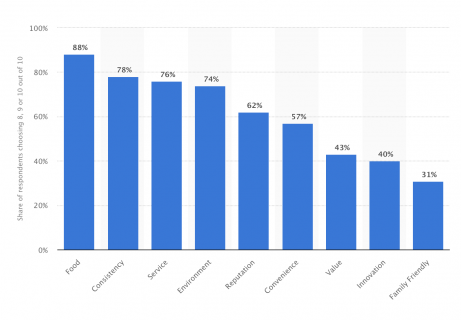 What drives people to your restaurant? What do they value most? Why do they keep coming back? When choosing a restaurant, there are some main factors that help determine a customer’s ultimate decision. For example: the proximity of the restaurant, the time available to dine and the type of cuisine they are looking for. However, there are handful of other drivers that impact their choice. In this article you’ll find the 9 Restaurant Choice Drivers influencing potential customers in their decision to visit… or not to visit your restaurant. What are Restaurant Choice Drivers? In the last 5 years, there have been heavy studies into “restaurant choice drivers,” or, the main factors that influence your customer’s decision making progress in choosing (or not choosing) a restaurant. They can be be summed up by the way a restaurant makes us feel. While they’re all important to factor into the running of your business, they are not all equal in the way they impact the decision making process. Some matter more than others. In the diagram below, the y-axis lists the 9 different choice drivers. These are ordered by impact or importance from left to right, with food and consistency being the most important, and family friendliness the least important. What this tells us, is that even if a restaurant’s interior wasn’t the newest (“Environment”), people would still keep coming if the staff are great (“Service”). Or, that people are willing to pay a bit more in exchange for smaller servings (“Value”) if a restaurant has a great rating or reviews (“Reputation”). Taste and consistency are, above all, the most important factors for return customers. To have an in-depth insight into your customer happiness, it’s important to stay on top of what makes them love your business, or, what keeps them from visiting you. To your customers, there’s no better place to share their honest opinion, than in an online review. That’s why, linking Choice Drivers to your incoming reviews and messages gives you a clear oversight of why your current customer base made the decision to pay you a visit. Businesses that keep track of their online customer feedback usually spot the generic trends in their customer reviews. But if you’re a growth-focused business, AreTheyHappy’s Tagging feature is an effective tool that gives you a more detailed understanding of what impacts your daily traffic. AreTheyHappy users could possibly tag the incoming message using the tags below. Of course, every business is totally free to create its own tags that match their concept. AreTheyHappy’s Insights give you an oversight of how your business is doing for each choice driver. It gives businesses an understanding of how they have generated customers, and, how they experienced their visit. This is shown in the “Insights” tab. All tags added throughout the day / week / month are calculated in AreTheyHappy’s data warehouse (see graphs below). In this widget, you see the general sentiment that people have, what themes were most talked about by your customers and where your customers are most active. Good tagging means, you can count the number of tags and see the positive and negative sentiment for each particular choice driver. Tagging features are now available for all AreTheyHappy users. Start your free trial to get access to all online Reputation Management Tools!